NuSTAR, formally known as the Nuclear Spectroscopic Telescope Array, has observed a supermassive black hole's gravity tugging on X-ray light that's being emitted near that black hole. That light is getting stretched and blurred, and researchers are getting to see it all in unprecedented detail, said NASA in a news release issued today. In this instance, the corona - a source of X-ray light that sits near a black hole - recently collapsed in toward the black hole that's named Markarian 335. The NuSTAR telescope has been collecting X-rays from black holes and dying stars for the past two years. The craft completed its primary mission earlier this year, and it was redirected to investigate Markarian 335 once scientists noticed that the black hole had become dramatically brighter. NuSTAR observed that Markarian 335's gravity sucked the corona's light, an illuminating action that NASA likened to someone shining a flashlight for astronomers. 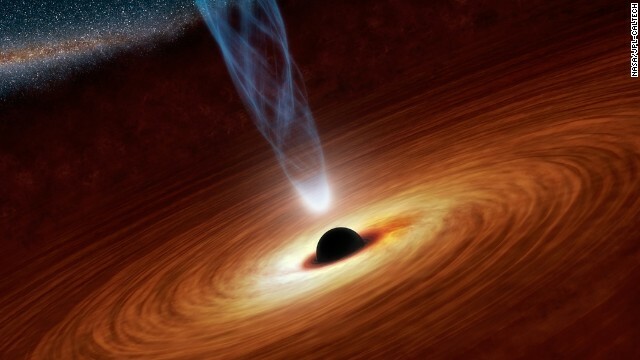 Scientists can now see the corona "lighting up material around the black hole," which allows them to study "the most extreme light-bending effects" of Albert Einstein's theory of general relativity, said NuSTAR's principal investigator, Fiona Harrison, in the news release. She is with the California Institute of Technology. Im patiently waiting for Nasa to say, now that this device is in place. when will it begin to tell us, when we will be sucked into this black hole. Im just thinking on a realistic level. if your aiming a x-ray from where we are into a blackhole, what does that say about what will happen to us, if we were in the same path when the X-ray was beamed?! Why do we get an artist rendering and not a photo? Mind blowing!!! So many questions!! !